On August 22 and 23, the fourth game of 47th Oui-sen between Oui Habu and Kisei Sato was held in Saga prefecture. Before the game, the score was 2-1 led by Habu. 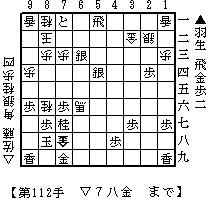 Habu played Sente(Black, lower side in the diagram) and Sato won the game with 112 moves. So the score after the game is tied by 2-2. It will be important to take the next game to lead the score since Oui-sen is 4-wins match. You may replay the full game in this page of Nishinippon Shimbun, one of the sponsors. For those who can read Japanese, here is the toppage of this game. You can reach many interesting contents including photos and video interview with both players through the page. The 5th game will be held on August 30 and 31. The diagram above is when Habu resigned seeing Sato's Gold drop on 7h. Here are the possible mate variations after the diagram. Sente's King will be mated whether he takes the Gold on 7h or his King escapes to 9g without taking it. I would like to share the sharpness of kNight sacrifice during some of the variations.